ARWA supports members in initiatives to improve security and emergency preparedness. There are several important tools available online. In addition, contact us if you need assistance. 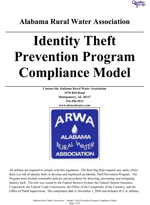 In 2009, ARWA designed the Identity Theft Prevention Program Compliance Model to assist water and wastewater utilities in complying with the Federal Trade Commission’s (FTC) Identity Theft Red Flag Rule. Assess their existing identity theft risk (risk assessment) for new and existing accounts. Use the risk assessment to select measures (red flags) that may be used to detect attempts to establish fraudulent accounts. Identify procedures for employees to prevent the establishment of false accounts and procedures for employees to implement if existing accounts are being manipulated. Obtain program approval by the governing body or designated senior management [originally, by November 1, 2008 (extended to May 1, 2009)]. Train the appropriate employees on the program’s policies and procedures. Update the plan annually with review and approval by the governing body or designated senior management. With heightened security measures underway at utility facilities, you may be interested in purchasing a number of these signs for your utility. Being prepared and alert to circumstances which could be detrimental to the production and availability of safe drinking water is essential. Please take measures to ensure proper security controls are in place.